Grodzinski, John R.. "Fenian Raids". The Canadian Encyclopedia, 30 May 2018, Historica Canada. 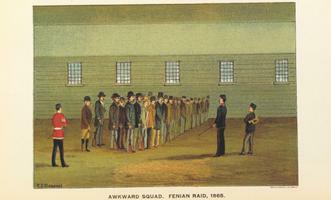 https://www.thecanadianencyclopedia.ca/en/article/fenian-raids. Accessed 18 April 2019. An imaginary incident during the Fenian Raids of 1866, by John McNevin. 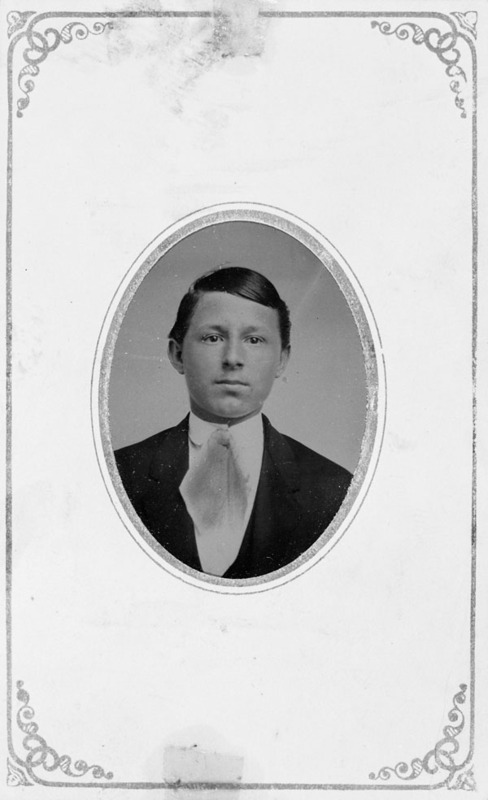 The Fenians were a secret society of Irish patriots who had emigrated from Ireland to the United States. Some North American members of this movement were intent on taking Canada by force and exchanging it with Britain for Irish independence. From 1866 to 1871 the Fenians launched a series of small, armed incursions of Canada, each of which was put down by government forces — at the cost of dozens killed and wounded on both sides. Fenians received their name from John O’Mahony, who labelled them after the Fianna Eirionn, the ancient Irish warriors. The society suffered a blow in 1865 when Britain crushed the Ireland-based independence movement, scattering its leaders. This situation left many Irish veterans of the American Civil War with considerable bad feelings toward Britain, and their membership in the Fenian movement quickly grew to around 10,000 men. Chief among the Fenians' goals was Irish independence, but they were divided on how this could be achieved. Some advocated staging a massive uprising in Ireland, while others favoured cross-border military action against Canada. British and Canadian officials took the threat posed by the Fenians seriously, and directed that spies originally planted to watch Confederate sympathizers in the northern United States shift their attention to the Fenians. In November 1865, a small number of militia were called out to garrison points in Canada West, modern-day Ontario (see Province of Canada), including Sarnia, Windsor, Niagara and Prescott. 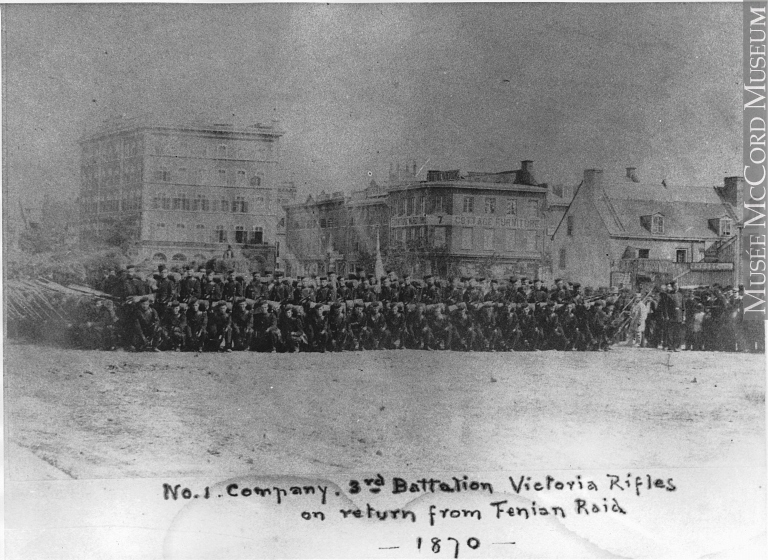 By March 1866, it was evident that the Fenians were going to act against Canada, resulting in the calling up of 10,000 — later increased to 14,000 — Canadian volunteers for active duty. Nothing happened and the volunteers were sent home. 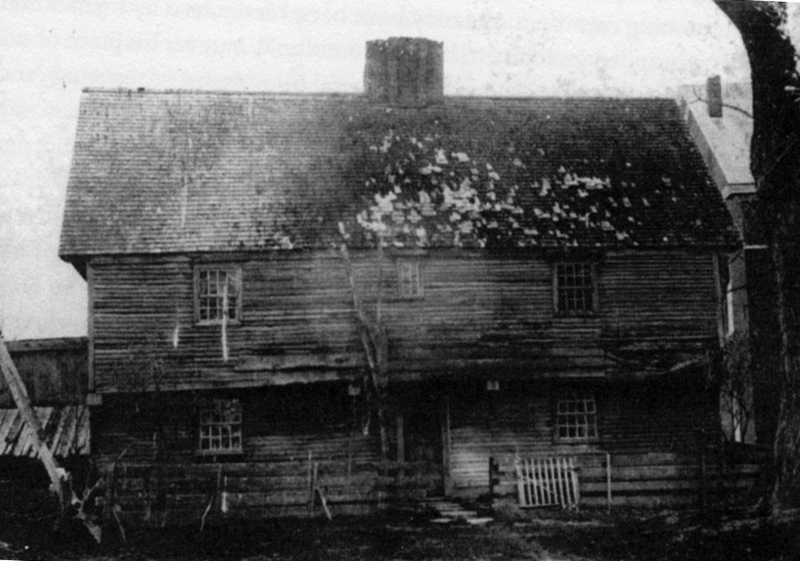 However, in April the Fenians staged a raid against Campobello Island in New Brunswick, achieving nothing other than the destruction of a few buildings. 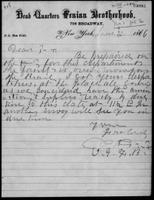 In May 1866, further evidence revealed a potential attack against Canada. The Fenians had ambitious plans to strike at several points in Canada West and Canada East, modern-day Québec. 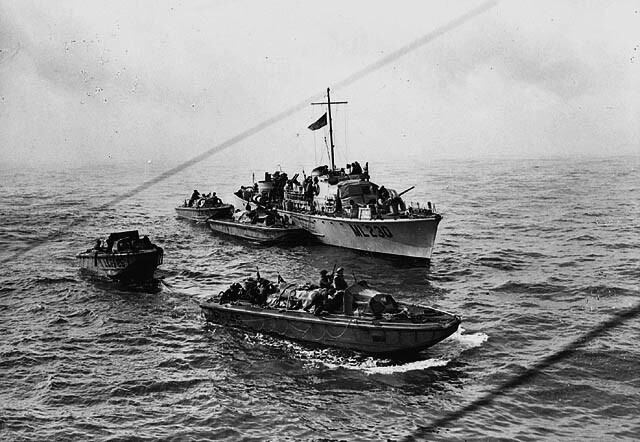 Twenty-thousand Canadian volunteers were quickly mobilized, while 13 small steamboats were commandeered and, under the guidance of the Royal Navy, patrolled the Great Lakes and the St. Lawrence River. Fortunately for Canada, the Fenian plans fell apart as fewer men than expected chose to join the forces concentrating at Chicago, Cleveland, Buffalo and other locations; Fenian leaders were also unable to requisition the ships needed to transport their forces. American officials, uneasy over how the invasion might affect Anglo–American relations, also intervened, arresting some of the would-be conquerors. With their plan in tatters, the remaining Fenians considered the alternatives, and settled upon crossing the Niagara River from Buffalo to Fort Erie in Canada West. 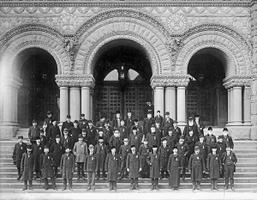 Noncommissioned officers of the 10th Royal Regiment of Toronto Volunteers. 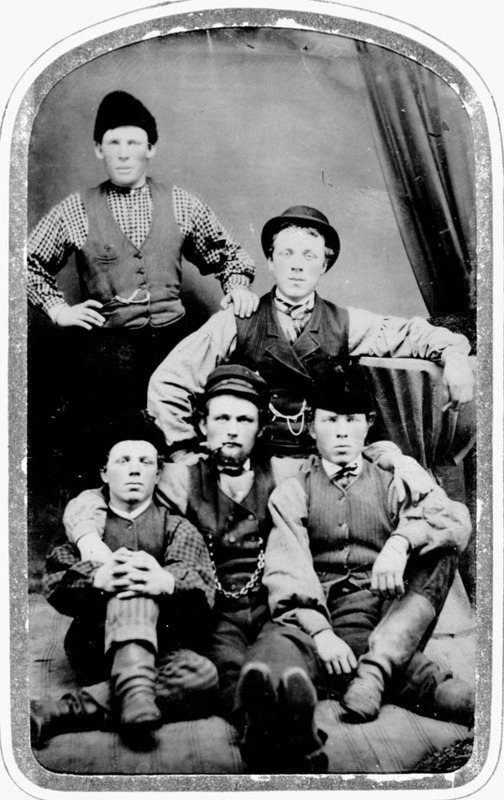 Sergeant James Pembroke Beddoes stands second from left, third row back, Toronto, Canada, c. 1870. 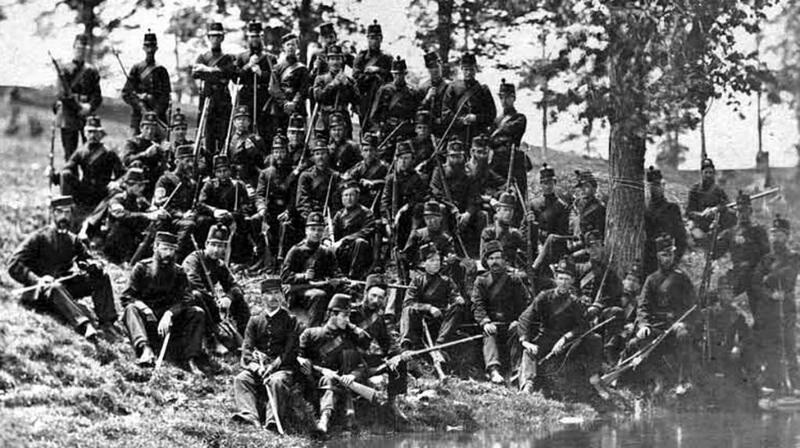 No 5 Company on maneuvers, Stratford, 1866. 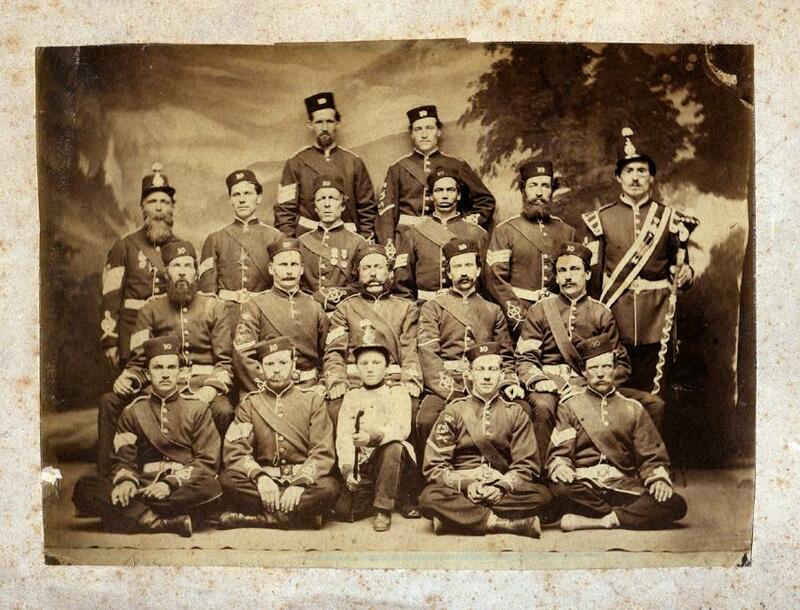 Officers of the Saint John Volunteer Battalion, Fenian Raid, 1866. No. 1 Co., 3rd Battalion of the Victoria Rifles, on return from Fenian Raid, Montréal, Québec, 1870. Frank Iveson (centre) and Peter Crerar (left) with unidentified men in Metcalfe, Canada West, 1865 (courtesy Library and Archives Canada/PA-103906). In early June, 850 Fenians led by Lieutenant-Colonel John O’Neill crossed the Niagara River, establishing a bridgehead near Fort Erie. They then advanced westwards towards Port Colborne. Meanwhile, Major-General George T.C. Napier, the commander of British forces in Canada West, had acted. Within a short period, a total of 22,000 Canadian troops were under arms and British regiments were on the march. Some 900 men from the 2nd (Queen’s Own Rifles) and 13th Battalions as well as the York and Caledonia Rifle Companies, under the command of Lieutenant-Colonel Alfred Booker, were sent to Dunville. Another column of troops, under British Lieutenant-Colonel George Peacocke, was en route to Chippawa, from where he would assume command of the British and Canadian troops. To contain the threat posed by the Fenians, Peacocke ordered Booker to Port Colborne. 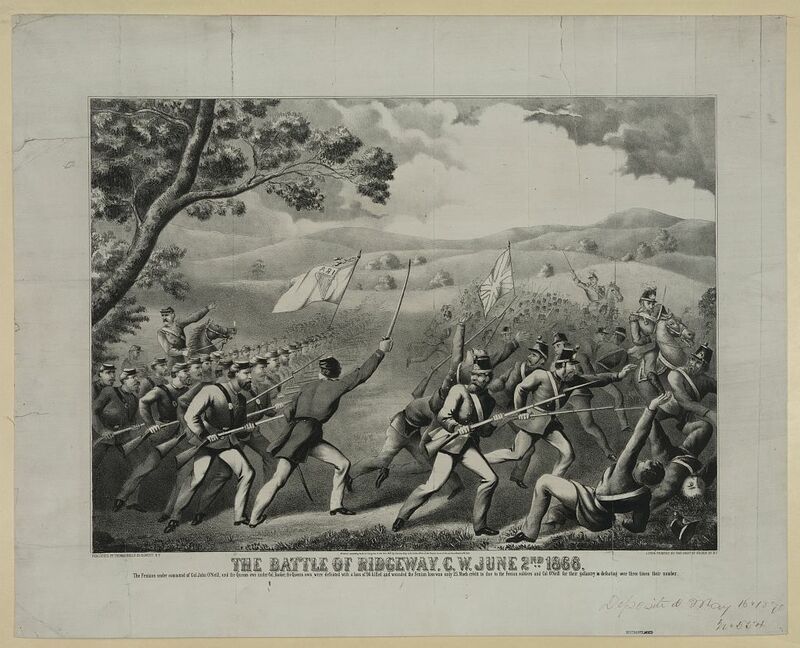 The charge of the Fenians under Colonel O'Neill at the Battle of Ridgeway, near Niagara, Canada West, on 2 June 1866 (courtesy Library and Archives Canada/C-18737). 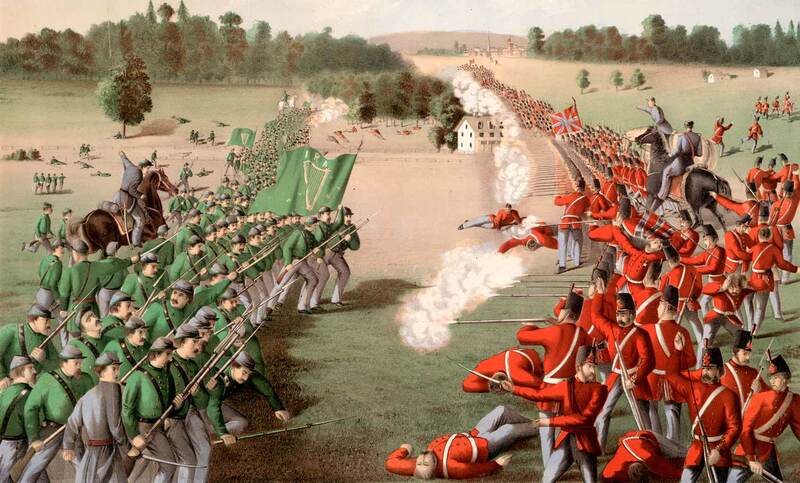 Fenian Brotherhood (Irish American) troops under the command of Colonel John O'Neill charging the retreating Queen's Own Rifles of Canada commanded by Colonel A. Booker at Ridgeway, Ontario, during the Fenian invasion of Canada, 2 June 1866. 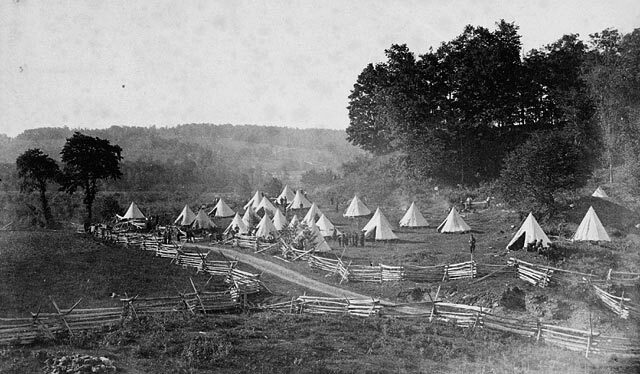 Having been ordered on 2 June 1866 to move to Fort Erie, Booker found 600 Fenians at Ridgeway and deployed his men. The battle opened well for the Canadians, who despite their inexperience, performed well under fire. It was not until someone ordered them to prepare for cavalry that the tide turned, as the militiamen moved into a defensive formation designed to repel a cavalry charge. But there was no cavalry and the Fenians were able to exploit the situation, forcing the Canadians from the field. Nine Canadians were killed and 32 wounded, while the Fenians lost 10 men killed and an unknown number wounded. The Fenians struck again a few days later. On 8 June approximately 200 of them crossed the frontier near Huntington, to the south of Montréal. After advancing several kilometers, they turned around quickly upon discovering that a large body of Canadian and British troops were converging on them. The defenders managed to catch and defeat the Fenians at Pidgeon Hill, which ended this round of attacks for a few years. Despite facing a number of setbacks, in 1870 the Fenians made a new attempt at invading Canada. In the meantime Confederation had taken place, and the new Canadian government was able to call up 13,000 volunteers to secure the frontier of Ontario and Québec. 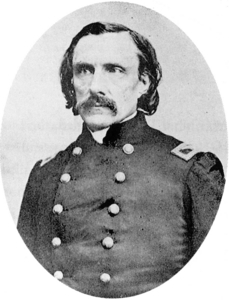 On 25 May 1870, John O’Neill (who had been proclaimed a hero after Ridgeway and appointed inspector-general of the Fenian forces) with some 600 Fenians, left Vermont for Québec. At Eccles Hill, just north of the border, they were met by a detachment of the 60th Missisquoi Battalion and elements of the Dunham Volunteers and another volunteer unit known as the Home Guard, commanded by Canadian Lieutenant-Colonel Brown Chamberlain. The Fenians were defeated in a short, sharp action, losing 5 men killed and 18 wounded. There were no losses to the Canadians. The Red Sashes at Eccles Hill, site of an 1870 Fenian raid. 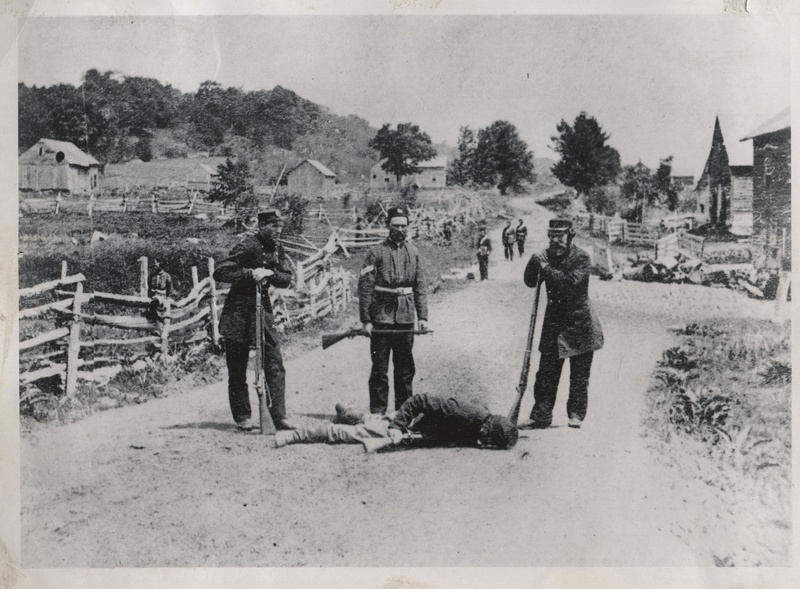 Border Volunteers stand over a Fenian slain during the Battle of Eccles Hill, 1870. Two days later, another group of Fenians crossed the border into Québec at Trout River, west of Eccles Hill. The 50th Canadian Battalion, the Montreal Volunteer Artillery, and the British 69th Regiment swiftly dealt with this invasion, and the Fenians fled back across the border. Again, there were no Canadian casualties. Across the Line of Richard's Farm. Showing Battle Field Ground. Canadian Volunteers Guarding the Line near Richard's Farm. 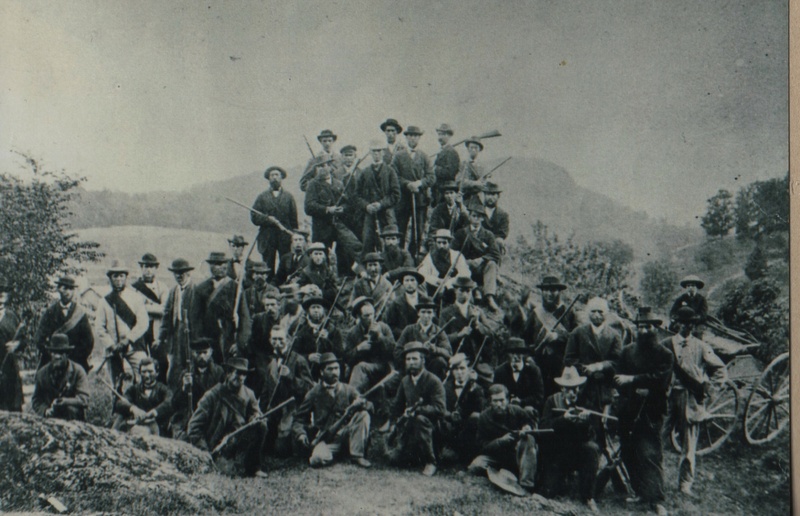 Captured Fenian canon and men of the Missisquoi Home Guard (the Red Sashes) following the raid on Eccles Hill, 1870. The final act by the Fenians came in October 1871, when O’Neill crossed the Manitoba border at Emerson and, with 40 men, took over a customs office. The next day, Canadian soldiers from Winnipeg and Saint-Boniface learned while marching to meet the invaders that the US Army had arrested O’Neill and his men, which ended the Fenian threat for good. The Fenian Raids owe their origin to Irish aspirations for independence. Although the Fenians did not achieve this goal, their raids revealed shortfalls in the leadership, structure and training of the Canadian militia, which led to a number of reforms and improvements in the years to come. 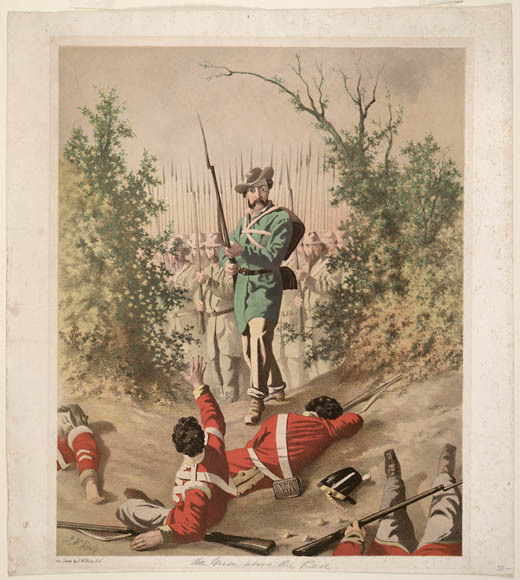 More importantly, the threat the irregular Fenian armies posed to British North America, along with growing concerns over American military and economic might, led to increased support among British and Canadian officials towards Confederation and the formation of the Dominion of Canada in 1867. The Fenian Raids - 1866A paper that chronicles the Fenian’s brief raid across the Niagara River to Fort Erie on June 1, 1866. Also describes some of the political motives for the raids. From the Niagara Falls Museums website. The Fenian BrotherhoodView medals and other items related to the 19th century Fenian Raids. From the Archives of Ontario. 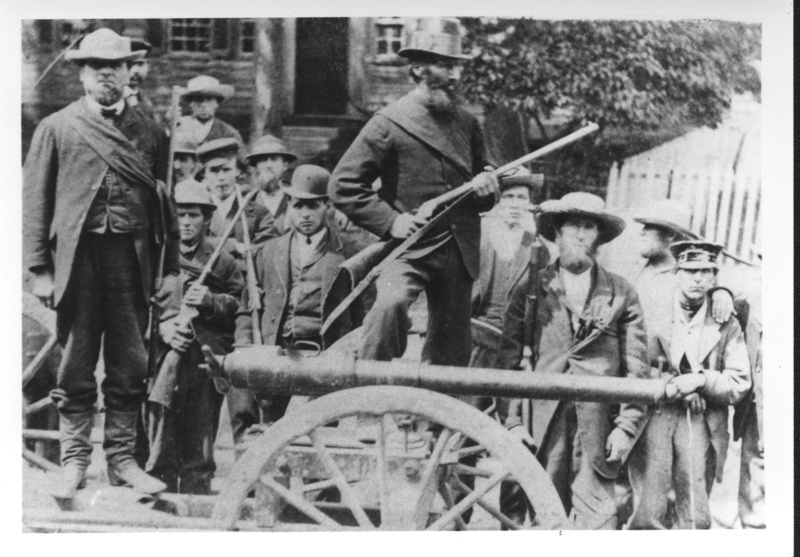 Fenian RaidsA brief feature about the Fenian Brotherhood’s raids into Canada that occurred after the US Civil War. From the Canadian War Museum.